The US Legal Framework Classes defined the SEC as a LKIF Executive Body and Financial Regulation as an outcome of its Rulemaking. Financial Regulation class is the ontology target for our Staging Class instances. FinancialRegulation is a form of regulation or supervision, which subjects financial institutions to certain requirements, restrictions and guidelines, aiming to maintain the integrity of the financial system. This may be handled by either a government or non-government organization. Financial regulation has also influenced the structure of banking sectors, by decreasing borrowing costs and increasing the variety of financial products available. CodeFederalRegulations is collection class for CFR sections and paragraphs. This is to differentiate CFR from other regulations. E.g. the European Alternative Investment Fund Managers Directive will be a sibling to this class. CFR documents are organized in sections. A CFR_Section contains group or container tag for search and retrieval purposes. CFR_Paragraph is the atomic piece of text in the CFR document. It is not divided any further. The LKIF contains property specifies that some thing is contained (spatially) within some other thing. A CFR section contains paragraphs. The Mapping Diagram shows the staging section and related classes, prefix “fo-fr-cfr”. 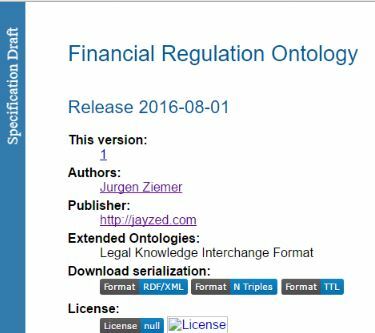 The target “fo-fr-sec-iaa:CFR_Section” ontology class has data properties of the information relevant to Finance. We do not need to remodel all of CFR. The lineage to the original staging records remains available. Note that there is no object property connecting SECTION with the related classes. The “contains” semantic is only in the XML data – not the schema. The target ontology will create class restrictions to enforce semantic integrity. LKIF object property “lkif-expr:bears” connects the Section to the SEC Rulemaking. LKIF object property “lkif-mereo:contains” ties the Section to its paragraphs. All target classes get an “sp:sourceInstance” object property. The source instance holds the URI of original CFR record. This provides end-to-end lineage and query capability. XML imports into Staging tend to be over normalized. The ontologist denormalizes into optimal OWL classes. Relational Database imports into Staging are often denormalized. Tables with a hundred columns that are not in 3rd, 2nd or even 1st Normal Form. The ontologist normalizes adding semantic to the OWL class structure. “fo-fr-cfr:P” is the class generated for paragraphs in the XML. “fo-fr-cfr:E” is for enumerations. These are small text fragments wherever the CFR document contains a list. We also have “sxml:Node” for the actual text. The target CFR_Paragraph transforms text and enumeration text to data properties. LKIF object property “lkif-mereo:contained_in” is the inverse property of “contained” and point to the section. The rectangular box “change namespace” denotes a direct class-level mapping: For every instance of “P” create an instance of CFR_Paragraph and change the URI namespace from “fo-fr-cfr” to “fo-fr-iaa-rule”. The connector from “composite:index” to “fo-fr-sec-iaa-rule:hasCompositeIndex” is a direct data property level mapping. BIND (fo-fr-cfr-spin-sec:convertCFRtoTargetInstance(?this) AS ?targetInstance) . being evaluated by the inference rule. assign the “sxml:text” property to our ?text variable. of ?this to the target URI. to define our mapping rules. SPIN is a W3C Member Submission that has become the de-facto industry standard to represent SPARQL rules and constraints on Semantic Web models. SPIN also provides meta-modeling capabilities that allow users to define their own SPARQL functions and query templates. Finally, SPIN includes a ready to use library of common functions. instances of source classes into instances of target classes. The SPIN Map engine will create a new instance of the target for every source instance. The target functions determine how the URI will look like. For the CFR_Paragraph we simply want the engine to replace the namespace prefix with fo-fr-se-iaa-rule. The preview list shows how the generated URIs will look like. The Class Form for for-fr-cfr:P shows the SPINMap rules behind the class and data property mapping of the mapping diagram. Like a database trigger the inference engine will fire the mapping rule for every instance of the source class.